This will make a statement with everyone. 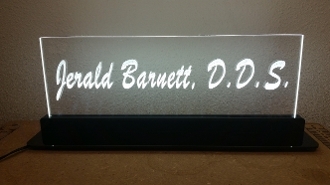 It is an approximately 4 3/4" x 12" acrylic piece inside an LED light base. Included are the battery pack with batteries, A/C power supply and USB connector for versatility. Please allow for 14-20 days to fabricate. Please include name of doctor (max of 20 char).